The destroyer is a spirit, a corrupted zeitgeist. while whispering in your ear. chewing up our courage, then spitting it out. she slices delectable discouragement for meat. she casts hope and care away. as if by atomic fission. maybe the big one even comes today. as we're all just fooling' around. Just glory in the art of pout. in spite of all that, we could be supremely blessed. your arrow is not destined to always miss. from the challenges of this screwed-up life. if we can allow the destroyer in us to be crucified. and to its own defeat is tied. they can't make you do it. and the destroyer's proposed eternal loss. but death itself in the end just dies. From the new novel King of Soul, now being researched and written, here's an excerpt. In chapter 4, we find Uncle Cannon speaking about murder in Mississippi, and then the scene changes. As Uncle Cannon was saying, on August 4, 1964 . . . It just so happened that, while Uncle Cannon’s projections were being uttered into the sultry southern air, a wave of a different kind was being set in motion on the other side of the world. It went thrashing just beneath the choppy surface of Gulf waters that lie between the coasts of China and Vietnam. The Gulf of Ton-kin. A phosphorescent wake—the eerie, night-time straight-line underwater path of a launched torpedo—went suddenly slashing beneath the stormy surface of the Gulf of Ton-kin, sixty miles off the coast of Vietnam. The torpedo had a target: a destroyer ship of the U.S. Navy. Under cover of the dark, stormy night, the torpedo’s path was nigh-impossible to see, almost as difficult to detect as the P-4 North Vietnamese patrol boat from which it had been launched. In the air above the USS Turner Joy naval destroyer, a plane-launched flare erupted, illuminating for a few moments the rain-stilted night sky. In the desperate brilliance of one flare flash, a boatsman’s mate caught plain sight of the attacking boat; he noticed, in the fleeting brightness, an odd detail—its long bow. Meanwhile, all hell was breaking loose, with the two U.S. Navy destroyers firing ordnance wildly into the stalking mysteries of the Tonkin Gulf. Two members of the gun crew sighted the offending boat in the strange light of their own exploding 3-inch shells; one squinting seaman managed to hold the object in view for what seemed like almost two minutes. Two signalmen, peering through dark Tonkin night-soup, strove to pinpoint the patrol boat’s searchlight, as it swept through the dark seas several thousand yards off the starboard bow; Director 31 operator could identify a mast, with a small cross piece, off the destroyer’s port quarter, as it was illuminated in the glare of an exploding shell that the Turner Joy had fired. Ahead of the USS Turner Joy, on the flagship Maddox, two Marine machine-gunners were posted on the ship’s signal bridge; after sighting what appeared to be the cockpit light of a small-craft, they watched through the fierce weather. Having no orders to fire, they visually tracked the unidentified vessel—friend or foe they didn’t know—as it churned up along port side of their ship; later the miniscule light was seen coming back down on starboard. Up on the flagship Maddox bridge, Operations Officer Commander Buehler was not surprised at the spotty hodgepodge of indecipherable bogey signals and sightings from various quarters of the two ships; for his ship’s radar contact had earlier indicated something approaching at high speed, which had suddenly turned left when it was 6000 yards from and abeam of the USS Maddox. He knew from the swerve that whatever that was—some vessel the radar contact had indicated—had fired an underwater torpedo. Approximately three minute later, a topside crewman on the Turner Joy had spotted the thin, phosphorescent wake of the torpedo as it missed both ships and then disappeared in the dark Tonkin waters that chopped beneath them. Later, black smoke could be discerned, rising in a column through the black night, and the mysterious P-4 bogey aggressors were seen no more. Where did they go? Davy Jones locker. We were in Rome about a year and a half ago, as part of a traveling celebration of our 35th wedding anniversary. One evening as we were lollygagging through the busy rain-slicked streets and sidewalks, we passed in front of a very special building. 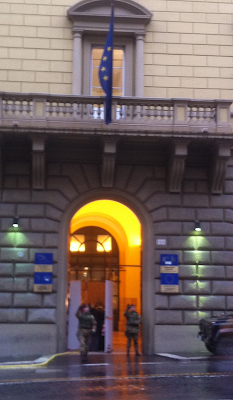 It was the Rome headquarters of the European Union, or "EU". I wanted to take a picture of the building's entry, because that is what tourists do--take pictures of important places. Seeking a broader view, I crossed the street. While positioning myself and the phone to snap a pic, the guard across the street noticed my activity. He started waving at me frantically, indicating that what I was doing was not permitted. Excuse me. I was taking a picture of a public building. Is this not the way you do it in Europe? No pictures of the RomeEU headquarters? If you squint at my little jpeg here, you may discern the guard's upraised right alarm, a gesture of command intended to communicate a stop order on my touristic activity. It vaguely resembles another raised-arm signal that was in use in Europe 75 years ago, during the regime of Mussolini and that German guy who considered the Italian dictator to be his own puppet. Or maybe I'm being too cynical about this incident. Maybe the guard was saluting me in some way, acknowledging my importance as an American tourist in the city of Rome. Now, a year and a half later, this morning, seated comfortably in my own humble domicile, back in the USSA . . . I was pondering the idea of government--whether it is truly "of. . .by the people", or is it something else? Is it, as many citizens insist during these times of tumultuous societal change, actually an institution through which the "1%" (or as they said back in the old days, the "rich and powerful") project their oligarchical manipulations upon the rest of us? I was thinking about this after reading online an article about how the worldwide financial system that has evolved. In this Seeking Alpha blogpost, Valentin Schmid, as "Epoch Times" examines our international monetary system. His analysis appears to be generated from a well-informed position in the world of money, assets and power. Mr. Schmid raises the question of whether the current (worldwide) debt load can ever be repaid, because there isn't enough "real money" to go around. This got my attention, because I have been thinking for a while that there isn't enough "real money" to go around. Haha, as if I knew about such things. I don't know much about money; if I did, I would have more of it.
. . . "I would argue central banks lost the ability to control the credit cycle. Some relatively minor event could trigger a series of events that creates the need for a sit-down among global monetary policy makers who finally have to acknowledge publicly that their policies are no longer able to control the system, the global economy, which is based on ever increasing demand through ever increasing credit. And what might occur is a natural drop in output. So you'll see GDP growth begin to fall. Real GDP growth across the world maybe even be going into contraction and that would spell doom for these balance sheets. And this is not something I'm predicting or trying to time at all, but the natural outcome of that would be a sit-down like a Bretton Woods where arrangements are reconsidered." To compensate for a stalling of global productivity, the movers/shakers of the world may construct a new, top-down rearrangement of the world financial system. The purpose of this revision will be to fix the problem of not enough money to go around. Such an extensive reconstruction as this would be has not been done since the Bretton Woods agreement that was promulgated by delegates from 44 Allied nations in 1944. In a 21st-century world inhabited by billions of inhabitants, our accessibility to natural resources has heretofore been determined by how many holes we could drill in the ground to extract natural resources; and how many acres of crops we could plant to produce food; how many factories we could build, and so on. . . building an economy to work toward spreading the bounty around. In the future, however, we will be moving to a "knowledge" economy. Wealth creation will not be about how much you can dig in a day's time, nor how much you can plant, nor what you can cobble together in your back yard or over on Main Street. Wealth generation in the future will be determined by what you know, so start learning now. Well gollee, maybe it won't be such a brave new world after all. However this thing plays out, if enough of us can master these three skills, .gov of the people, by the people and for the people will not perish from the earth, we hope.